Save the date and register for our annual breakfast celebration. Complimentary valet parking available, as well as street parking and paid parking lot nearby. 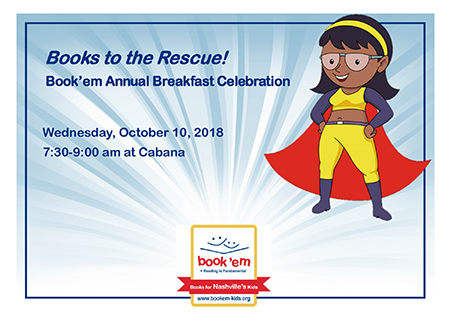 Enjoy a breakfast buffet, inspirational speakers and learn more about how Book’em is expanding to serve more children in need. Suggested minimum donation of $150. To register to attend the breakfast, please click here to complete the registration form. Interested in learning more about how your company or organization can become a sponsor? Click here for more information or contact Chelsea Cahill at Chelsea@bookem-kids.org or 615-255-1820. Interested in hosting a table and inviting your friends and colleagues? Contact Chelsea Cahill at Chelsea@bookem-kids.org or 615-255-1820 for more information. Can’t attend this year, but want to donate to support more children? Click here to make a donation online. Or mail a check made payable to Book’em to Book’em, 161 Rains Ave, Nashville, TN 37203. Have other questions? Contact Chelsea Cahill at 615-255-1820 or Chelsea@bookem-kids.org. We’re excited about this year’s celebration. Everyone who supports Book’em is a hero in our book!